Sr Ruth Danielski died suddenly on January 9th, less than 24 hours after she returned to Massachusetts from her beloved mission in Jamaica. The Lord had granted her desire to remain in active missionary service to the end of her life. Ruth Danielski was born in Chicago, Illinois in 1931, the only child of Francis J. Danielski and Helen Lux. She entered the Marist Missionary Sisters in Bedford, Massachusetts in 1949 and made her first vows on February 2nd, 1952. 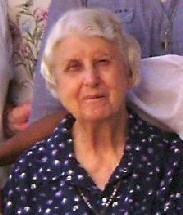 She graduated from Framingham State Teachers’ College before leaving for her first mission assignment to Fiji in 1957. Throughout her life, in whatever country she served, Sr Ruth was known as a dedicated and effective teacher who showed great concern for her students. 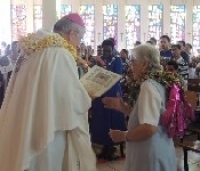 During her years in Fiji, she served in several schools, and was Head Teacher at both Stella Maris Primary and the Fiji Chinese School (now the Yat Sen School) in Suva. Many of her former students who have learned of her death have written to share their memories and appreciation of Sr Ruth. In 1973 she returned to the USA and studied for her Masters Degree in Education at Boston State College. She served as a member of the Formation Team and Vocation Director from 1975 to 1982. She was known for her collaboration with the other branches of the Marist Family in Vocation Ministry during those years. In 1982 she was assigned to the SMSM community Memphis, Tennessee, where she taught at Little Flower School and later at Cathedral School and was Religious Education Coordinator. In 1987 she obtained her Masters Degree in Religious Education from Loyola University in New Orleans. Sr Ruth joined the SMSM community in Chicago in 1993. There she continued her teaching at a Catholic parish school whose students were mainly African-American. Being in her “hometown”, she was also able to help her two elderly aunts, who were her closest living relatives. 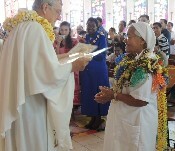 Sr Ruth was first missioned to Jamaica in 1997 and soon grew to love the people and the place. 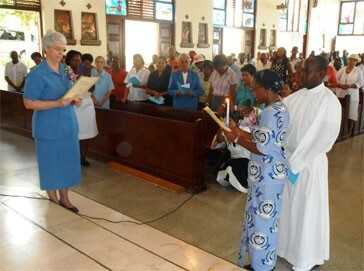 In Montego Bay she became Director of Religious Education and Coordinator for the Lay Leadership Program in the diocese. In May 2009 Sr Ruth returned to the USA for health reasons but still managed to be involved in several activities: teaching English as a second language to new immigrants, working in the RCIA program at Sacred Heart parish, and chairing a committee of SMSM working on a “history project” for the North American Province. She also brought joy to the community by sharing her musical talents for playing the organ or piano at different celebrations. 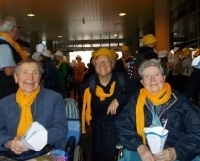 In September 2010 Sr Ruth returned to Jamaica – this time to Havendale, in the Kingston area. She was soon asked to be involved in the training of catechists in three parishes as well as in religious education classes. Bishop Charles Dufour, with whom she had worked in Montego Bay, had become Archbishop of Kingston, and again called on Sr Ruth to assist him with correspondence and paper work, which she gladly did. In December 2011 Sr Ruth returned once again to Massachusetts, and this time she underwent surgery for cancer. On February 2nd, 2012 she celebrated her 60th jubilee of her religious profession with the Sisters in Waltham. She made a good recovery and was permitted to return to Jamaica in August 2012. When Sr Claire Rheaume, our Mission District Leader, went to Jamaica for a meeting with the Sisters there in late December, Sr Ruth participated as usual. However a few days later it was clear that she was gravely ill, and she took the opportunity to return to Massachusetts with Sr Claire. She had just one night at Newton Street, and died at Newton Wellesley Hospital the following afternoon, January 9th, 2013. 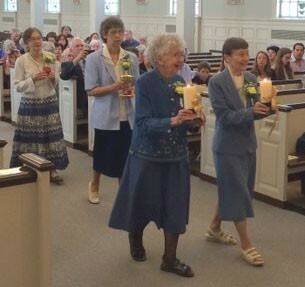 Her funeral in Waltham was a joyful celebration of Sr Ruth’s life. Sr Anne Quinn and Fr Carl Clarke, a Jamaican priest, came from Jamaica for the funeral. Fr Carl was the main celebrant and seven other priests joined him to concelebrate: two other Jamaican priests; Jesuits who knew her from her time there, Marists who had worked with her when she was vocation director in the USA, and our parish priest from Sacred Heart. It was a testimony to her life-long spirit of collaboration with others in the work of the Church. 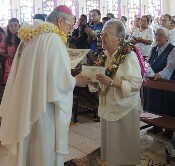 Before the funeral, Archbishop Dufour had made the request that Sr Ruth’s ashes be brought back to Jamaica, where she could be buried with Sr Rosalie Warpeha who died there in 2006. This was accepted, and a memorial service was held in the cathedral at Montego Bay on January 26th 2013.
inviting us to go forth today. May you be welcomed to your true home in the embrace of our Mother and Her Beloved Son.